There's a growing polarization in America and which I've pointed to in articles hosted in one section of my web library. The Congress is dominated by people with an ideology that seems to want to take America back to the early 1900s, with few protections or support systems for working families and the poor, and with a far Whiter population than we have today. I keep seeing photos of new born babies and young children posted on Facebook by my nieces and nephews, and by kids who were part of the tutor/mentor programs I led in from 1975 to 2011 and I ask "what kind of future will these kids inherit?" This is particularly relevant since my own two kids are half Chinese and many of my nieces and nephews are full Chinese, or Jewish with a mixture of Chinese and American. And the kids from the tutoring program I led are almost all African American, with a few Latino kids in the mix. These are the "brown, black, and yellow" skinned people that the Far Right segment of the GOP and the #POTUS45 administration want to eliminate from the America they are trying to create. 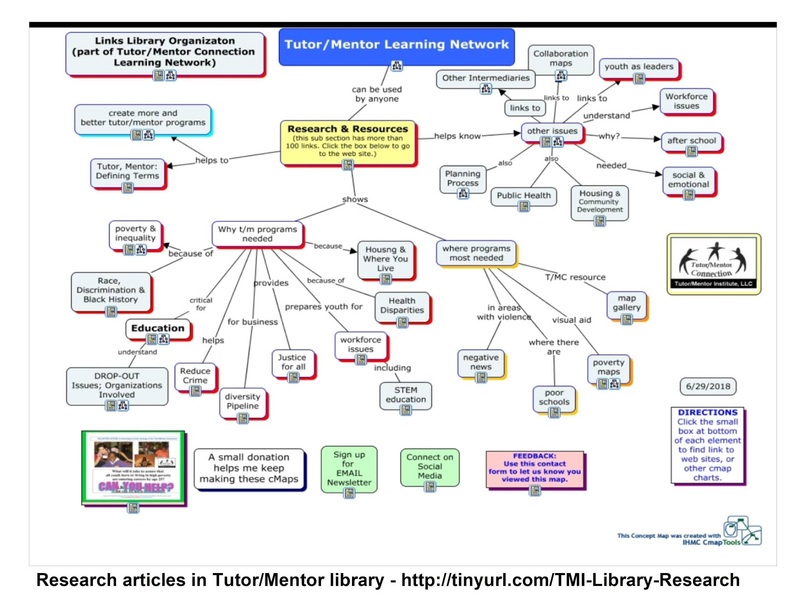 I've posted a wide range of graphics on this blog since 2005 showing the diversity of adults and youth who connect in organized, on-going non-school tutor, mentor and learning programs. When I post photos like this I know from personal experience the work it takes every day, year-after-year to make programs like this available and to recruit youth and volunteers and keep them coming back year after year. 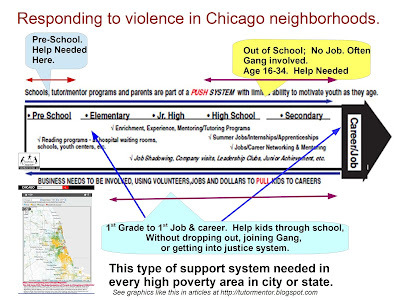 When I post photos like the one at the right, I'm showing the wide range of reasons volunteers and kids can connect, and using a map to emphasize the well organized, mentor-rich programs are needed in all high poverty neighborhoods of Chicago and other cities. However, my vision goes beyond creating these places in neighborhoods throughout America. 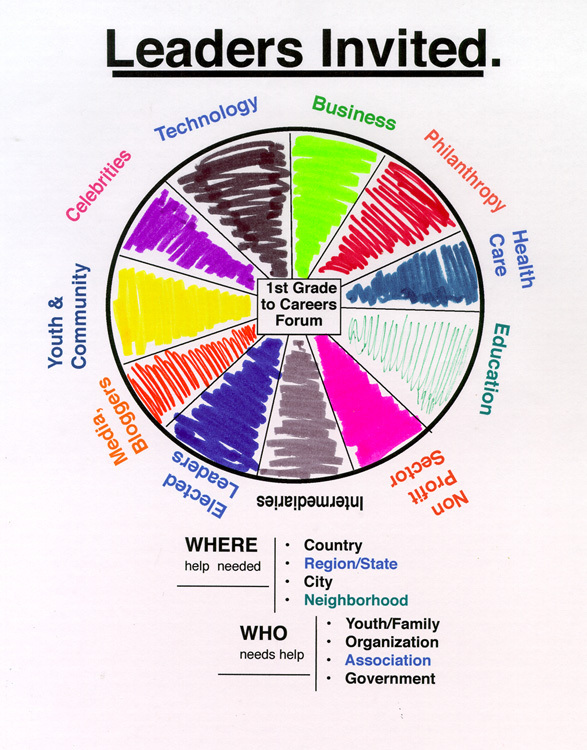 As the graphic below shows, I want to find ways to connect the volunteers, board members, youth, parents, donors and community leaders from each program, with each other, and with a library of information and ideas that they can talk about, reflect on, and use as inspiration for what they do to help individual programs get better, and help each program provide a transformative experience, for the youth AND the volunteers who get involved. Below is another graphic that shows what I've been writing about. The shaded areas are high poverty neighborhoods in Chicago. The oil well icons represent places where youth and volunteers are connecting every week for tutoring, mentoring, learning, enrichment and college and career coaching. Some of these programs might enroll youth when they are entering first or second grade. Others may start youth in middle school or high school. Once a youth enrolls, many of these organizations do all they can to help those kids move all the way through school to high school graduation. 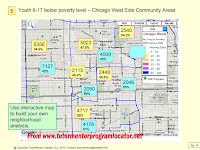 A visitor looking at the list of Chicago youth programs that I host on my web site or any entry point on the Internet should be able to find a map like mine and click on icons, which take them to the web sites of the different tutor and mentor programs in the city. 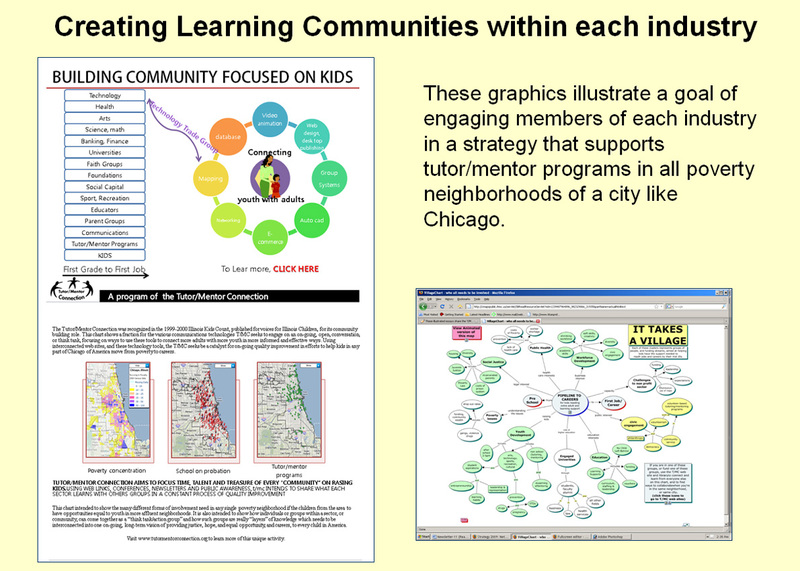 Each web site should have visualizations similar to mine, showing how they attract volunteers from many backgrounds and form a community of extra adults committed to helping the kids they serve succeed in school and move safely into adult lives. I created this "shoppers guide" pdf to illustrate what I feel should be on a program's web site. Very few show all of these indicators. 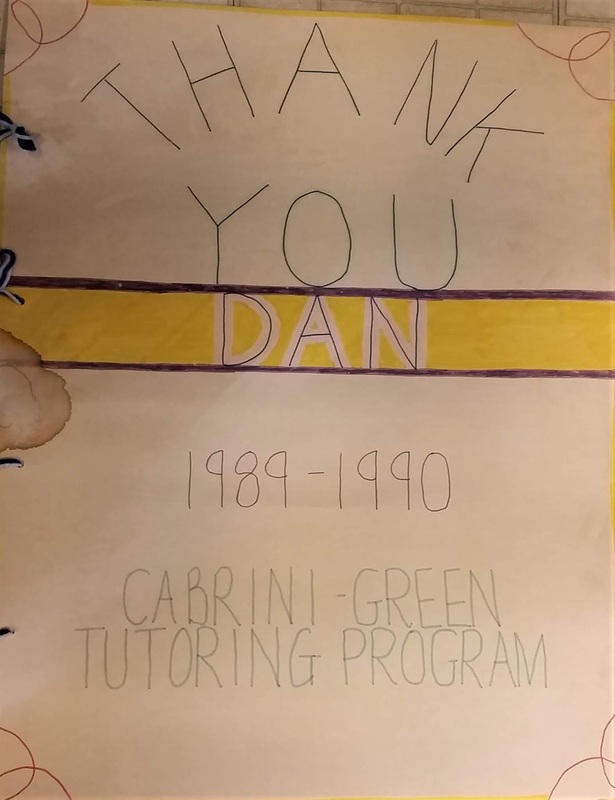 Many of my articles emphasize the need to build new ways to provide on-going, flexible operating dollars to every tutor/mentor program in the city so they can build and sustain these long-term strategies. One way to do this is to engage volunteers who are from places where there are concentrations of wealth and/or where decisions are made about how that wealth and talent is being used to benefit the community. Another is to engage teams of volunteers from different industries who take a long-term approach to how they use their time, talent and dollars to help multiple tutor/mentor programs in a city grow. 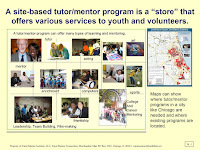 Interns working with me between 2006 and 2015 created two visualizations that show how volunteers who are well supported in organized tutor and/or mentor programs often are transformed in the ways they have a better understanding of the challenges of living in high poverty areas and are willing to help attract needed resources to support the kids, and programs, they work with. Click here and here to view these. 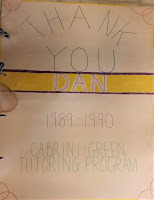 Do not think of my goal as just building non-school, volunteer based tutor/mentor programs that transform the lives of inner city kids and the volunteers who join these programs. 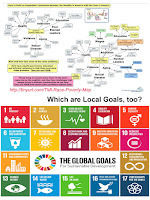 I want these programs to be an entry point to a life of learning and service where volunteers begin to expand their understanding of all the various challenges people living in high poverty areas face every day, and ways they might become directly, or indirectly, involved in helping to reduce those challenges. My nieces and nephews live in New York, Philadelphia, Chicago and many other parts of America. 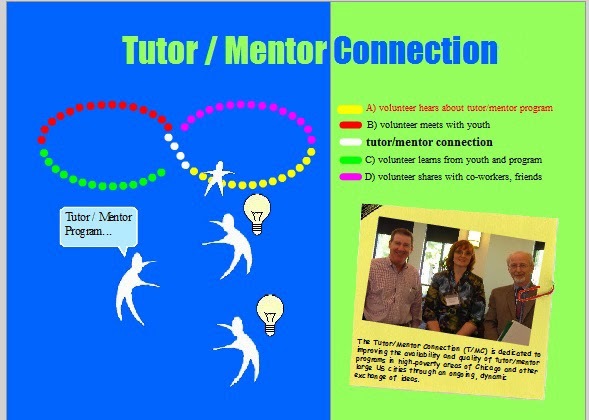 Alumni of the tutor/mentor programs I led are spread across America, as are volunteers who have been involved. For all those who are bringing new kids into the world, or who already are raising their own children, I challenge you to think of ways you can share the ideas in my blogs and the Tutor/Mentor Institute, LLC web site with people in your own network and community, and to use your own time, talent and connections to help build a 'tutor/mentor connection:' type intermediary that supports the growth of a full range of youth tutor/mentor programs in your own communities. While I still have a few years in me I'll help you. Don't wait. Don't look back in 20 years at the world and ask "What could I have done differently?" 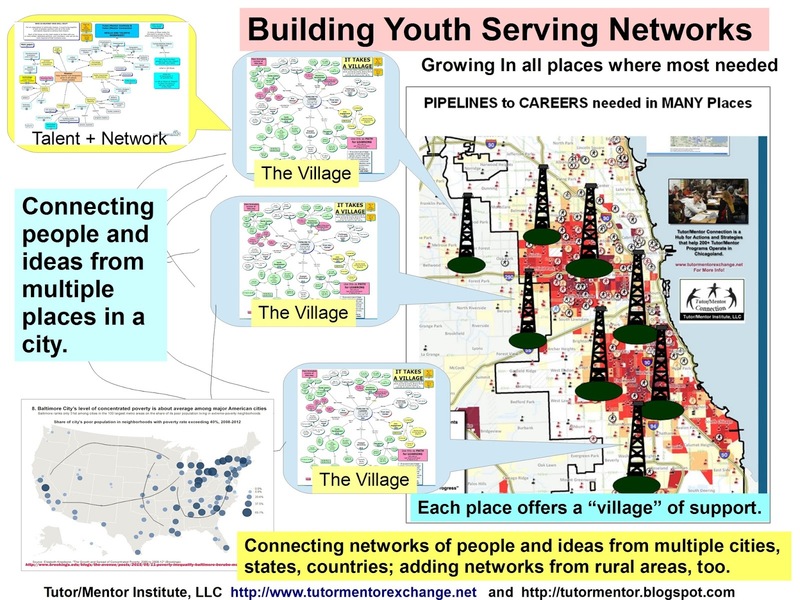 For over 20 years I've focused on how community leaders and networks can use maps to build a better understanding of all places within a geographic region like Chicago where poverty and other indicators show a need for long-term systems of youth and family support. I still don't see enough examples of this happening. 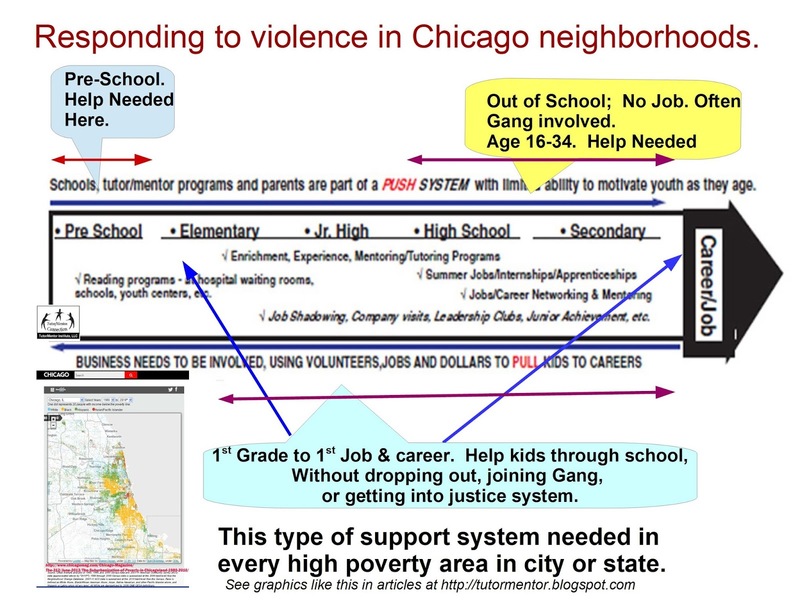 Below is a graphic showing a map found on the Homicide Watch Chicago web site. Every red icon points to a life lost in Chicago. You can zoom in on this map to focus on specific parts of the city. The inset at the top right shows Chicago's West side. I could have looked even closer, at a smaller area, like the Austin neighborhood. The homicide map shows that the West and South parts of Chicago have the highest frequency of homicides. 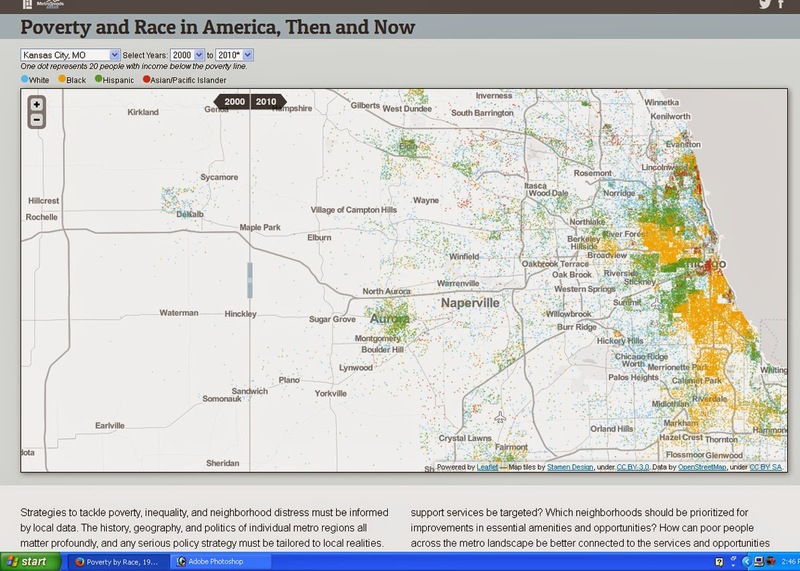 If you look at other maps, such as the one at the left, you can see that these areas also have the highest concentrations of poverty and racial minorities. 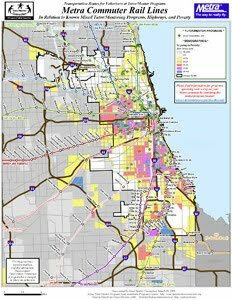 Visit the Urban.org web site and you can find a collection of data maps that you can use to visualize where people need extra help. 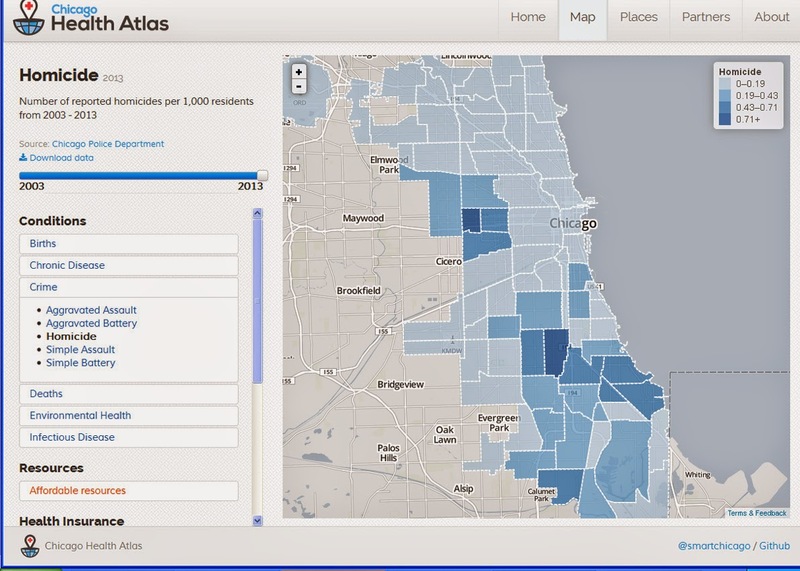 Another resource is the collection of data maps available at the Chicago Health Atlas web site. 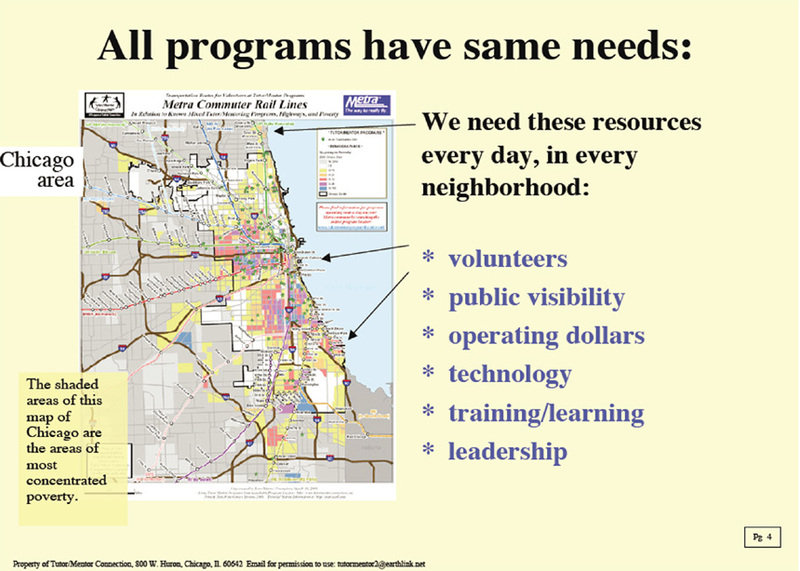 With either of these resources and many others that I point to on this data maps page, leadership groups in different areas can build a visual and spatial understanding of what sections of Chicago need extra help. 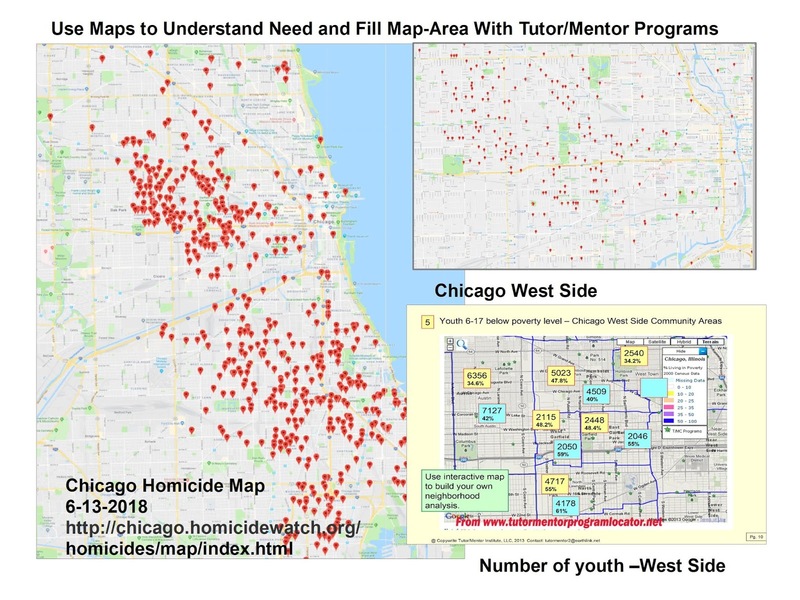 However, there's another level of data that needs to be used if the goal is to help kids grow up safely and without detours into gangs, crime, juvenile justice or icons on these homicide maps. I included this map on the featured image. It also shows Chicago's West side. However, it includes information showing the number of high poverty kids, age 6-17, living in each community area. The yellow box shows this data for 2011 and the blue shows the updated data as of 2018. 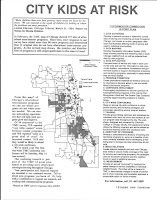 You can see this map, along with other Chicago community areas, in a PDF available here, and here. If you zoom into my map you can see some green stars. 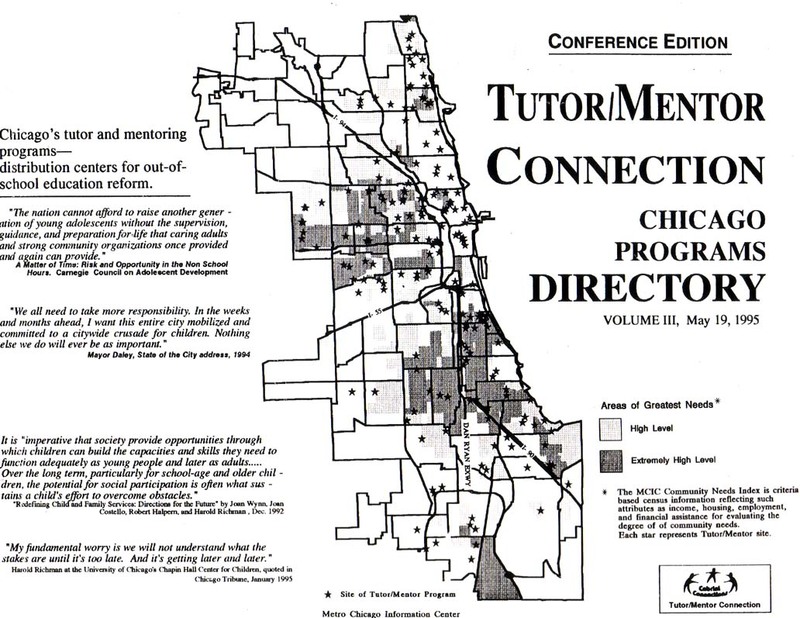 These are locations of known non-school tutor and/or mentor programs that the Tutor/Mentor Connection identified via its on-going surveys, which were first launched in 1994. 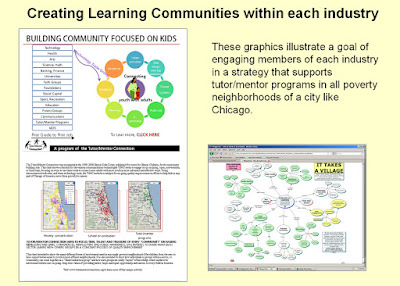 The map image used was from a Chicago Tutor/Mentor Program Locator, created between 2004 and 2009. 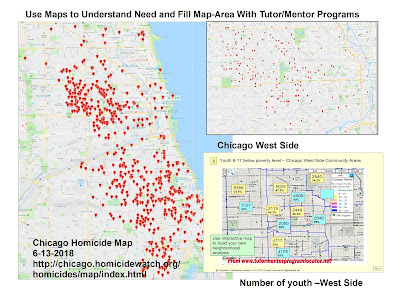 Due to lack of funding this has not been updated since 2013, so a different map, and list of Chicago tutor and mentor programs can be found at this link. 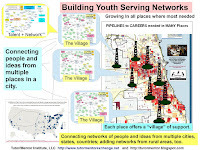 The goal of this, and other articles that I've been writing for 20 plus years is to motivate teams of people in different areas to use these maps, and other information in the Tutor/Mentor web library, as part of an on-going planning process intended to fill every high poverty area with needed youth and family support programs. 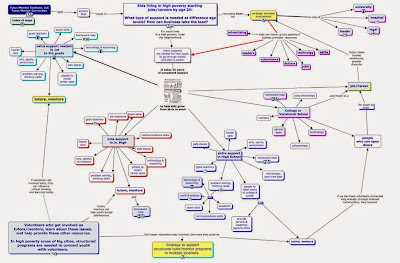 If you browse through past articles on this blog you'll find each of the graphics shown in the concept map and you'll find a link to an entire collection of similar maps. You'll also find many articles that include GIS maps like the ones I show in this article. At the heart of all this information is my list of Chicago non-school tutor and/or mentoring programs, sorted by sections of the city. In this page on the Program Locator, you can also see an effort to sort by age group served, and type of program. 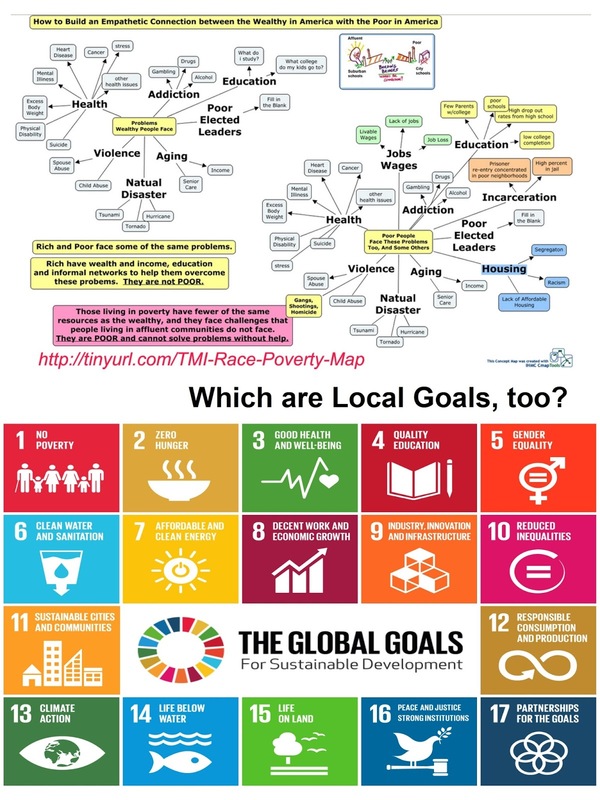 This information is absolutely needed if any on-going marketing and leadership is going to fill high poverty neighborhoods with a full range of birth to work programs. 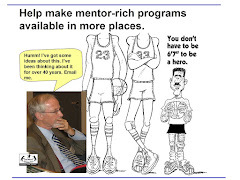 Instead of starting new programs all the time, I've tried to identify and give support to every existing program, helping each constantly move toward being great. At the same time, I've tried to show where there are voids, in age group served and/or type of program, so that planners could use this data in their own on-going efforts. Organized non-school tutor, mentor and learning programs are just one of many supports youth and families need. 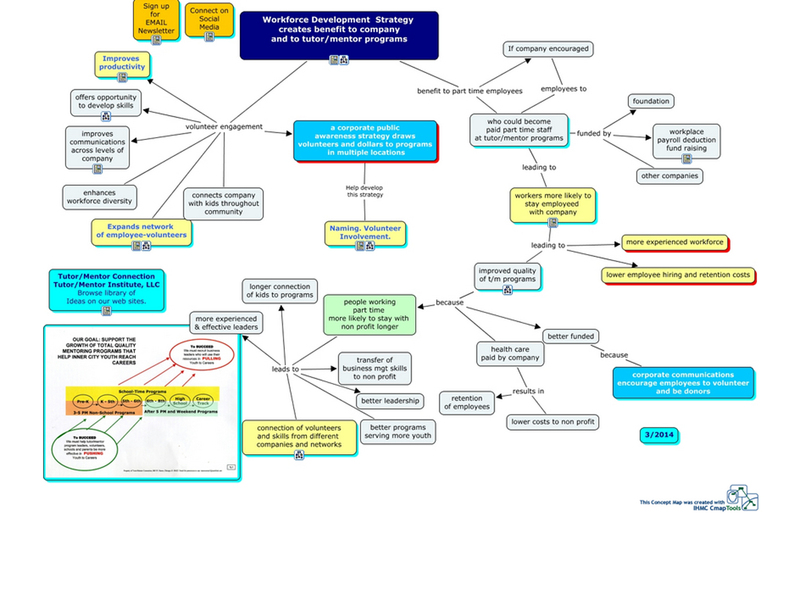 I've used this concept map to show some of the age appropriate supports I think are needed in most high poverty areas of Chicago. A planning process should identify which of these supports are available in different neighborhoods and work to help them stay available, while working to bring in new resources to fill voids. 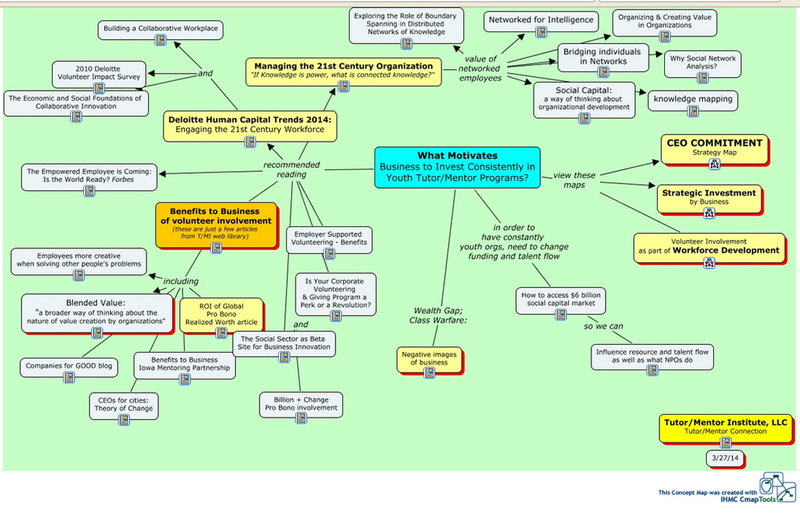 A similar concept map, showing commercial and jobs assets in different areas could be used the same way. 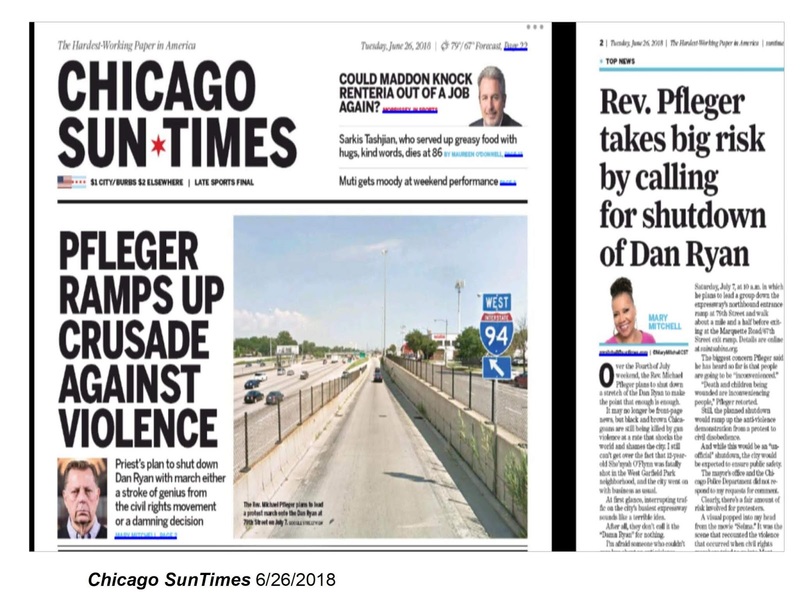 If you've read this far, there are two takeaways. 1) you can use these ideas in any city, or any neighborhood and you can dig through past articles to understand what I've been trying to do, then duplicate what you think will work for you. 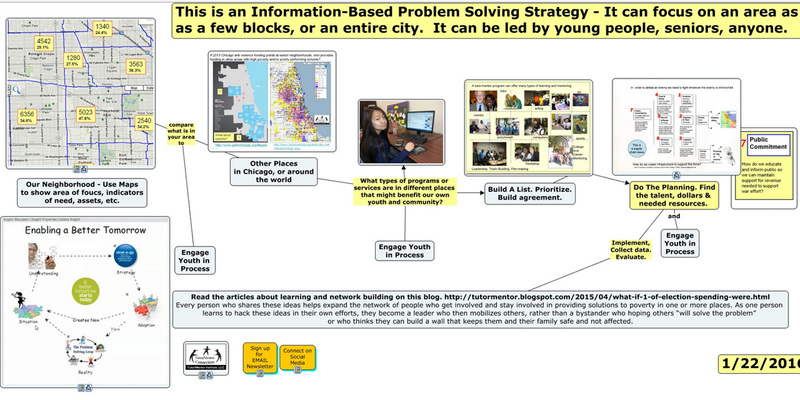 Since I've not been able to update the Program Locator, and other people are also building lists of youth serving organizations, I created this concept map to point to many places you can use to search for program information. 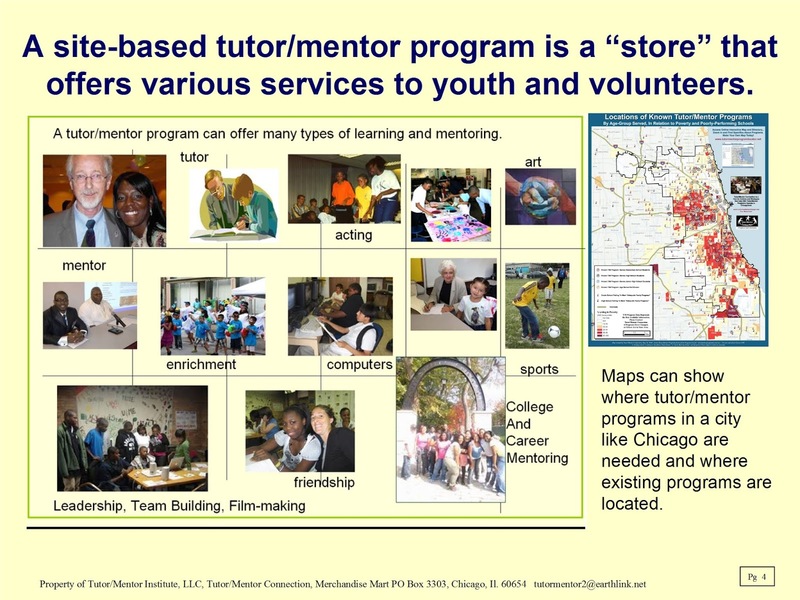 2) you can offer time, talent and dollars and/or partnership, to help me update and upgrade the Chicago Tutor/Mentor Program Locator, making it work for Chicago and making it freely available to leaders in other cities. You can also go to this page and make a small, or large, contribution to help me keep these resources on line until I find some people who will respond to suggestion number 2. 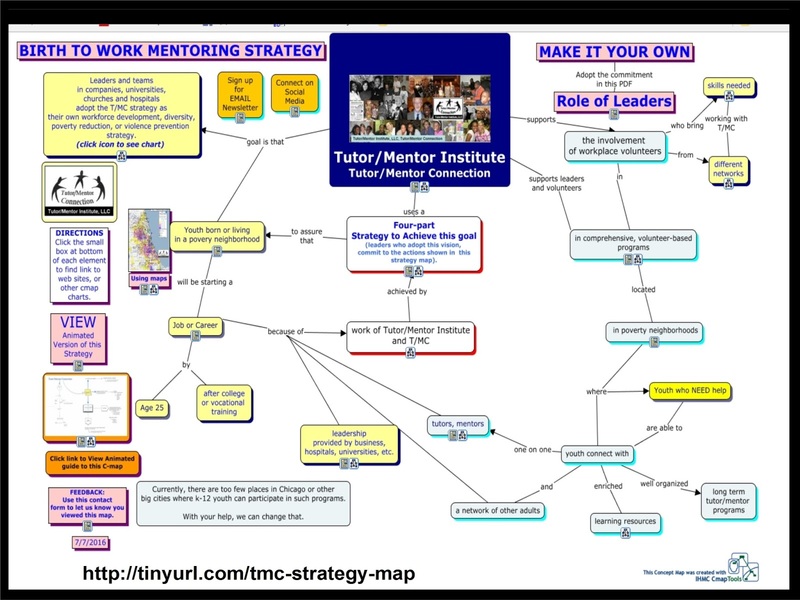 I urge you to connect and share your mapping and planning ideas with me on Twitter @tutormentorteam or on LinkedIn or Facebook. Workforce Development. Violence Prevention. Role of Business. 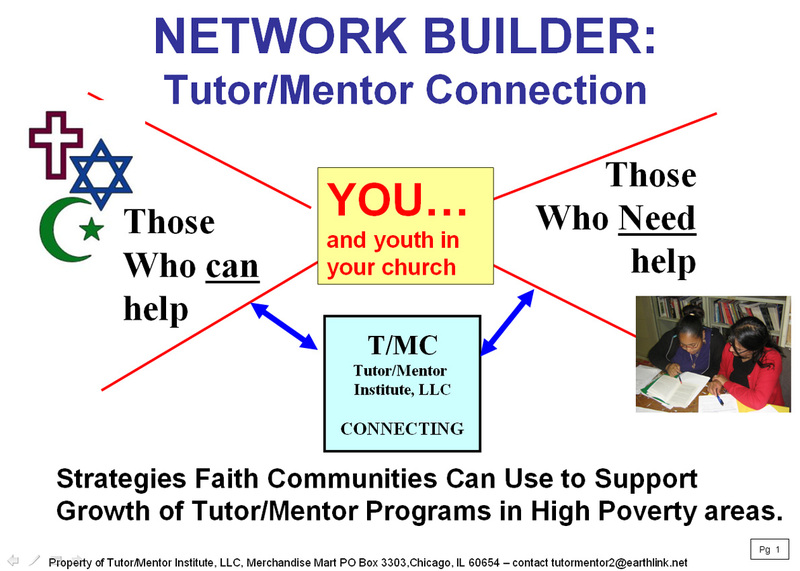 I have used the graphic below since the 1990s to describe an ideal youth tutor/mentor program where volunteers from many business and education backgrounds connect with kids in elementary or middle school and provide a wide range of supports that not only help kids through school, but help open doors into jobs and careers. Each spoke on this wheel leads to an industry segment. If you read the daily newspapers or view videos like this, or read articles like this Deloitte Human Capital Trends Report, 2018, you'll see that business is very concerned about the future of its workforce, and the growth of its business. Below is another graphic that I have used often. Imagine that each of the arrows on the above graphic leading from the hub to a spoke looked like the arrow shown below. Within the arrow are a variety of age-appropriate supports that business could be bringing to youth in school and non-school programs. Many already do this. However, I've seen few using maps to show an intent to provide such support in every high poverty area of cities where they do business. In these graphics I include maps, to illustrate the need for birth to work youth development programs to be in every high poverty neighborhood. 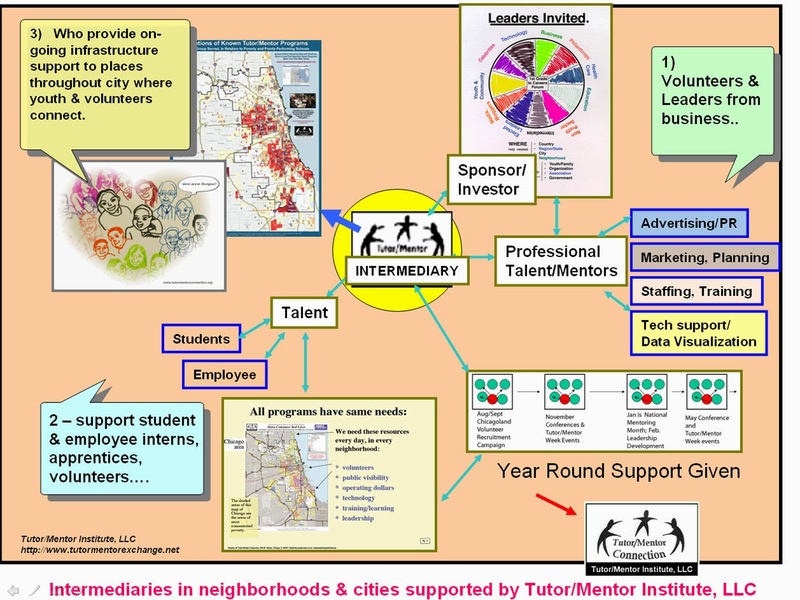 I use the graphics to emphasize the role of business in engaging its resources, jobs, employee talent and dollars, to build and sustain a system of mentor-rich youth supports in every city where it does business. The Deloitte report starts out focusing on the role of CEOs and company leaders. The commitment they need to make is the same one I included in this ROLE OF LEADERS pdf, which I've been sharing for over 20 years! While Step 1 is leadership commitment. Step 2 is "Appoint a 'get it done' leader to be responsible for researching, developing and implementing company strategies. Step 3 is "do the research" to learn what you already are doing, what your employees are already engaged with, and what others are doing that you could duplicate and do better. The final step is a report to the CEO showing progress made in one year and plans to continue the work in the following year. I've created a series of concept maps showing why business should be taking this role. 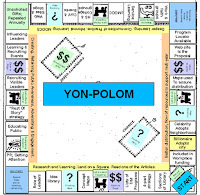 In each are links to articles that should be part of the "research" and "learning" that is done by company planners. Take a look. Share them. Create your own. 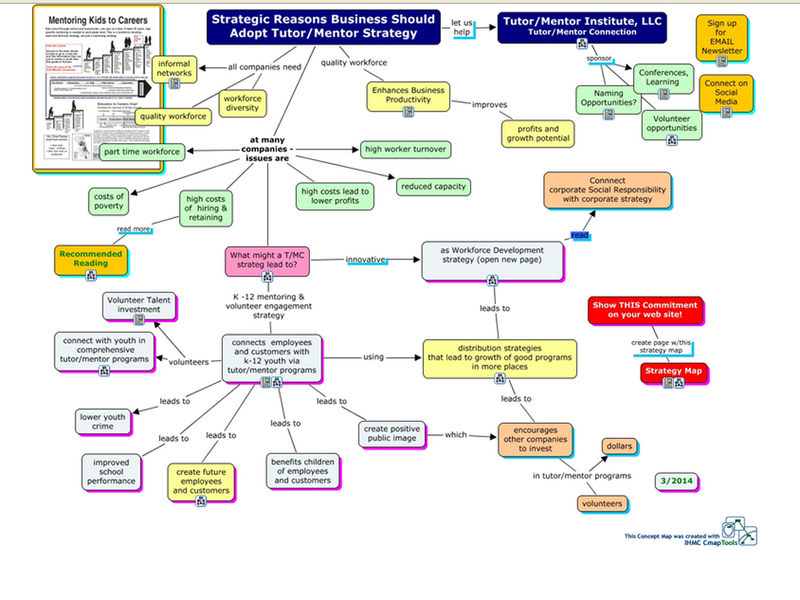 First map focuses on reasons a company or industry should invest strategically in youth tutor/mentor programs that are designed to connect k-12 youth with workplace volunteers. 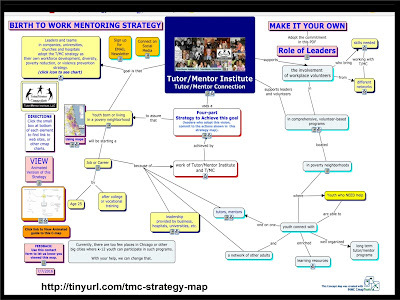 Second map shows reasons to adopt the Tutor/Mentor Connection/Institute, LLC strategy. Third map points to articles from Deloitte and other companies that provide more reasons to get involved strategically in helping pull youth through school and into jobs and careers. This final map shows commitment CEOs from every industry need to be making to help draw kids from high poverty neighborhoods into their future workforce. Strategies developed for this hard-to-reach segment of the population will apply to youth from other economic backgrounds, too. These maps are part of a library of articles that you can find here, and a set of cMaps that you can find here. Many people have told me often in past years that "this is too much information" and "no one will take the time to read this" yet that's the point of gaining CEO commitment. This is not charity. This is survival and growth of US industry, commerce and our standard of living. It's about creating equality of opportunity for all Americans and better democracy and standard of living for all. 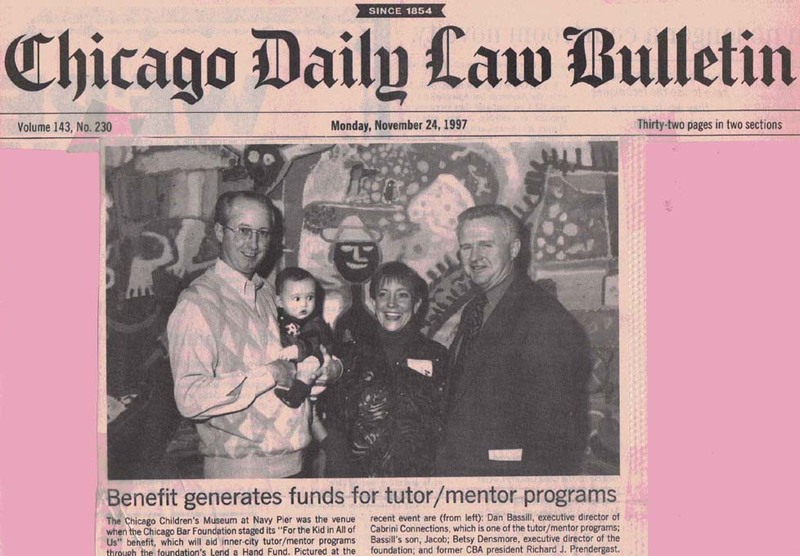 Ten years ago I wrote this article, talking about a $300 million dollar donation being made to the University of Chicago. 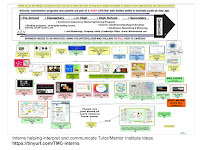 I suggested that some wealthy tech leader could make a similar gift, to establish a Tutor/Mentor Institute on a college campus, with a curriculum that had students from 9th grade through PhD level reading and learning from the articles I've posted on my web sites and blogs and the links in my web library. 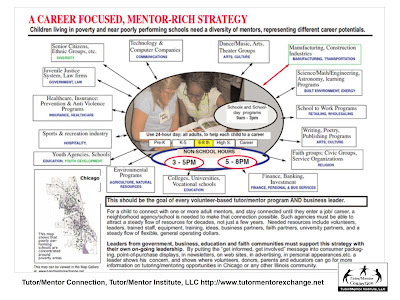 If someone had responded to that offer in 2008 that university, and that benefactor, could today be producing maps and articles like mine, with icons showing where graduates from that program were now leading youth tutor/mentor programs in different Chicago neighborhoods, as volunteer board members, paid staff, donors, tutor/mentors, elected officials, media and in other roles. Similar maps could show business, college, hospital and/or faith group locations in Chicago, with icons on each to indicate their level of strategic involvement with youth and youth development organizations in their section of the city or suburbs. 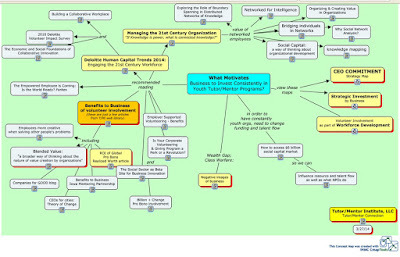 Browse articles posted between 2008 and 2011 at the MappingforJustice blog to read more about this idea. That offer still stands. Maybe in 2028 such a map will be available. 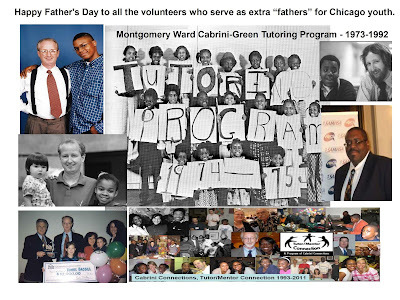 I created the Tutor/Mentor Connection in 1993, and Tutor/Mentor Institute, LLC in 2011, to help volunteer-based tutoring and mentoring programs grow in all parts of Chicago. I've been following four concurrent strategies every day since then, which you can read about here, and here. 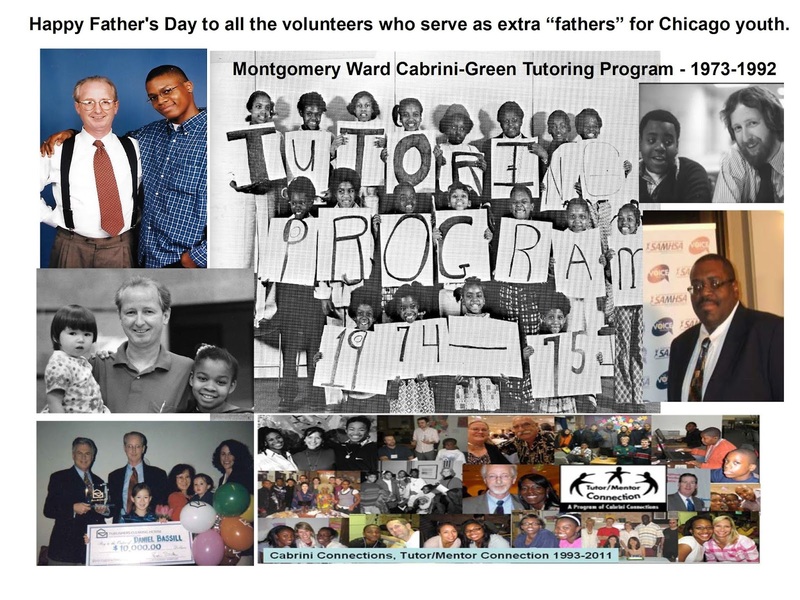 While Step 1 involves building a list of Chicago tutor/mentor programs, which is on-going, Step 2 involves efforts that draw attention and resources to each program on my list. Here's one way I do that, and that anyone can duplicate, for the same goals. 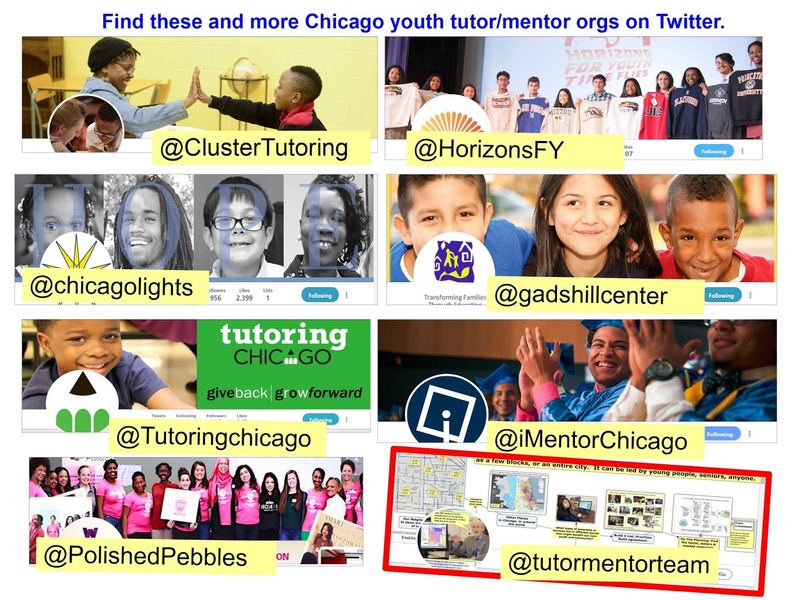 In this graphic are screen shots of the Twitter home page for seven organizations, along with the home page of @tutormentorteam, which is my account. All I did was open the Twitter list that I use to follow youth tutor/mentor programs in Chicago and in other cities and scroll through to find recent posts of Chicago organizations. I used the "print screen" button on my PC keyboard and pasted the image into a Power Point page, then cropped it and re-sized it. 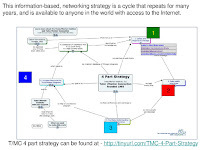 Then I added the Twitter handle of the organization and saved the PPT as a JPG image, which I can use in many places. 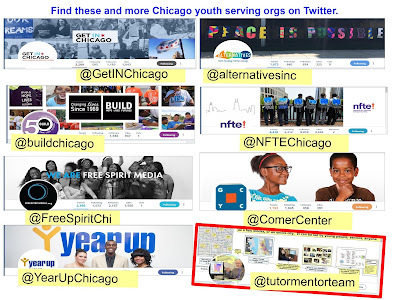 I could make a half-dozen versions of this since more than 40 Chicago youth orgs post information on Twitter. Some do this more than others. I'd like to encourage more to use Twitter. I could do that. But, if YOU do this, and post your graphics on Twitter, Facebook, Instagram and/or LinkedIN, you will help more people learn about these programs than I can with just my own efforts. That's the goal of the articles I've posted on this blog since 2005 and that I share in email and printed newsletters in the years since 1993. 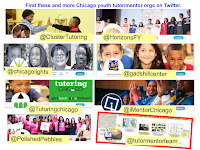 If more kids in Chicago and other cities are to have access to well-organized, volunteer-based tutor/mentor programs then more people will need to duplicate what I've been trying to do, using their own talent and communications ability to tell the stories of existing programs and to point to places where more programs are needed. It's easy to do. No cost to you. It helps kids connect to mentors and tutors and helps reduce violence and inequality in the region. 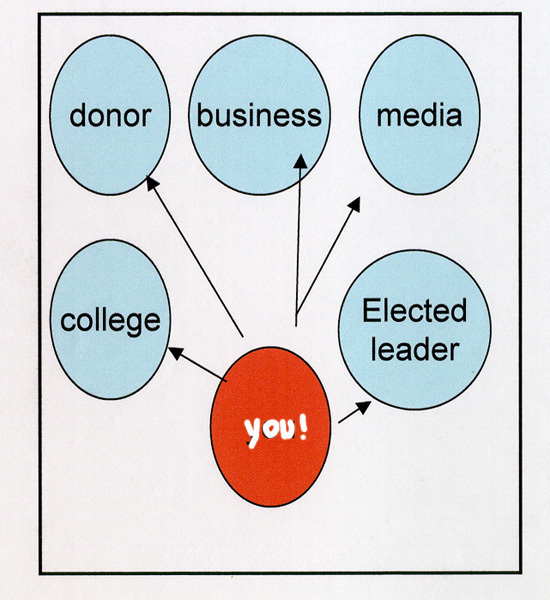 The YOU could be a business, sports or celebrity person, political leader, faith leader or youth in a middle school classroom. Anyone can do this. 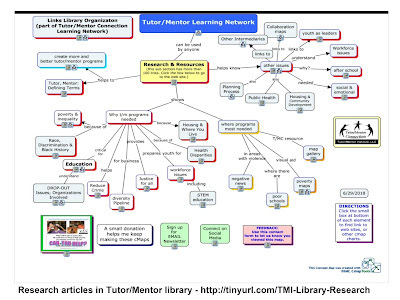 If you take this role include @tutormentorteam on your Tweets so I can see what you're doing. 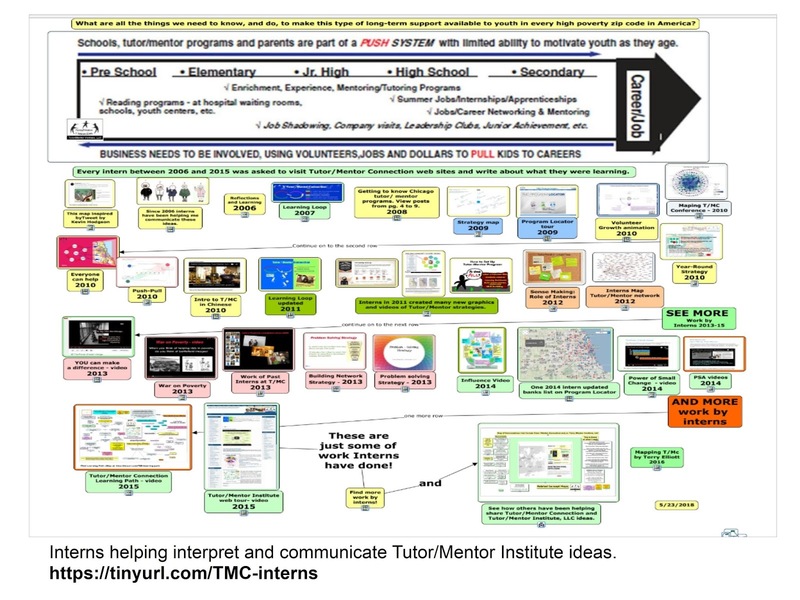 Last week I posted an article with this cMap showing work interns did between 2006 and 2015 to interpret and share ideas and strategies that I had originally launched as PDF essays and/or blog articles. I hope you'll take a look. I think these ideas can be applied anywhere, but far too few people know they exist. 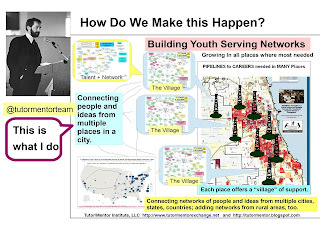 I also feel that youth in schools and non-school programs could be creating their own versions, pointing to their city and/or neighborhood. Below is an example of how this works. 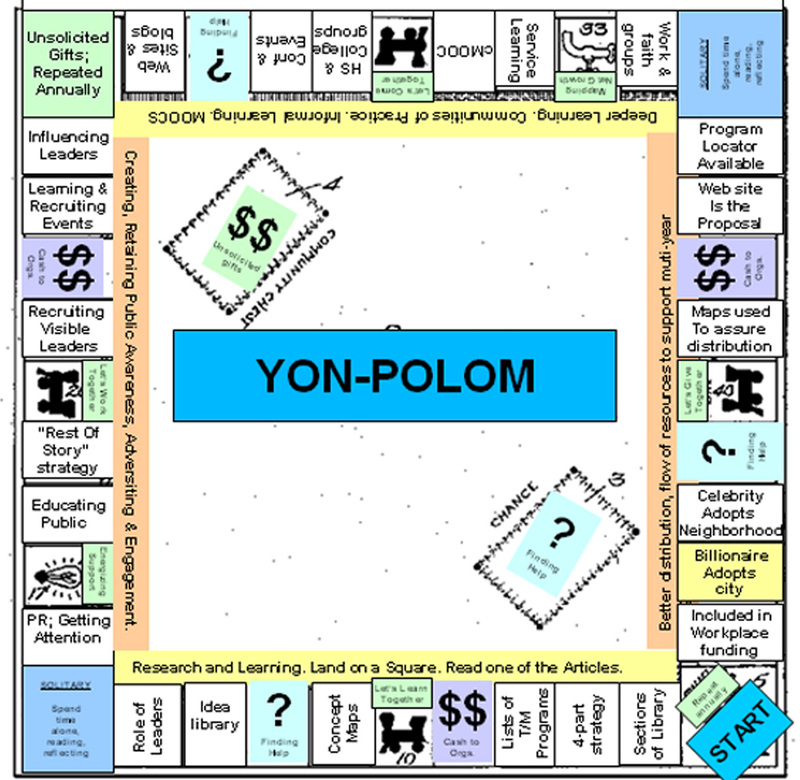 It's a pdf essay that I created to visualize the need to influence what resource providers do, not just what leaders, staff and volunteers in non profits do. 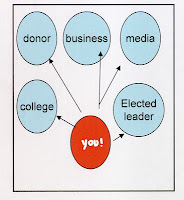 The "how to influence change" idea was originally communicated in this blog article. 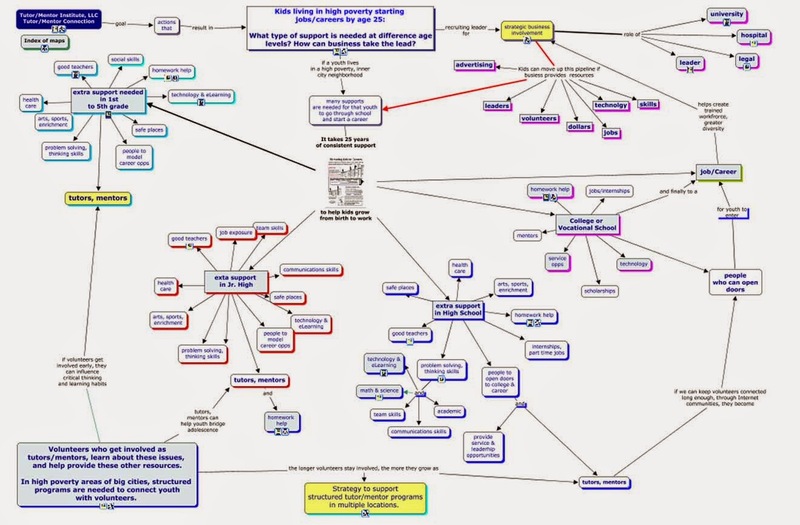 Below is a video done by one of our interns to communicate the information in the PDF. 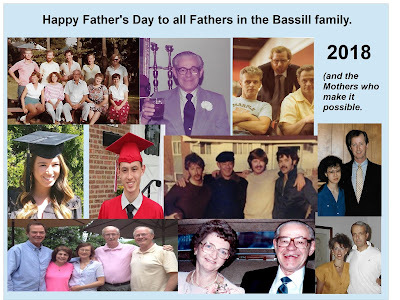 Over the past 20 years I've written hundreds of blog articles and created many pdf essays. They're all intended to expand the network of people helping inner city youth get the extra adult support they need to move through school and into adult lives. 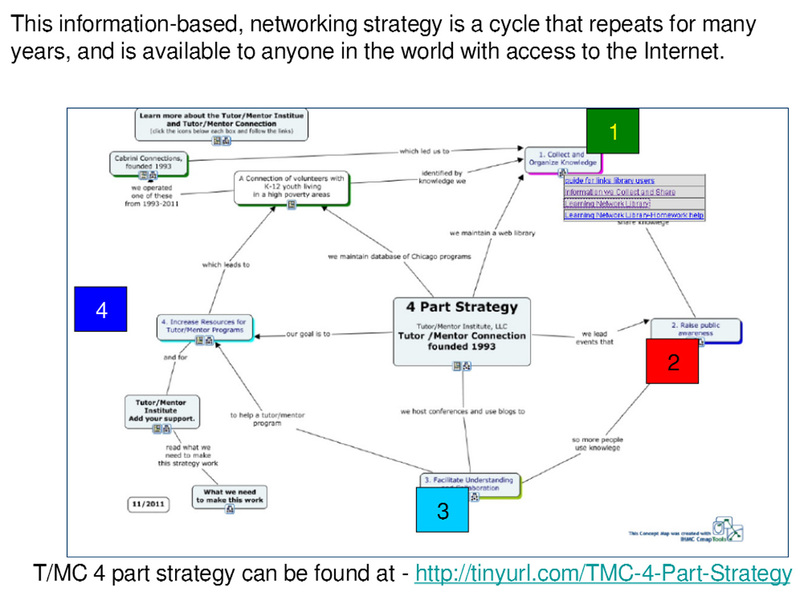 On this page you can find a list of the pdf presentations, including links to Slideshare and Scribd where I've posted some of these. 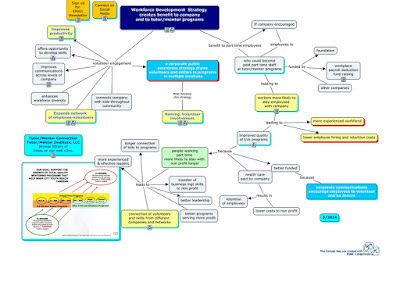 The concept map I refer to at the start of this article shows work done by many interns. 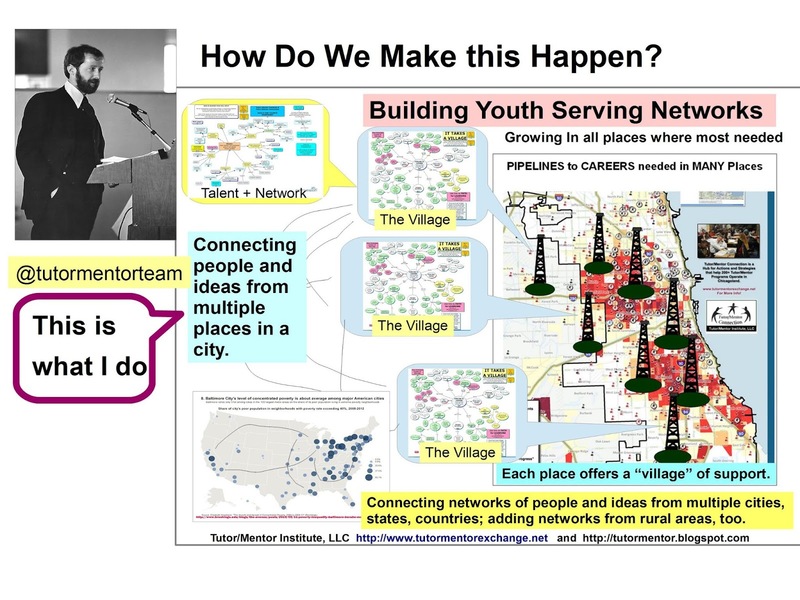 Imagine if you were able to create a similar map a few years from now, showing work students and volunteers did to communicate ideas and strategies showing how your organization or community network is helping kids move through school. I urge you to spend time looking at these. 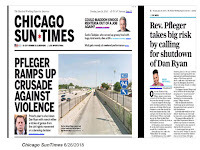 Then enlist youth and volunteers to create their own versions, applying the ideas to helping youth in Chicago, or in other cities, or specific neighborhoods. 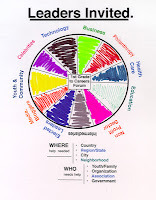 As you see how this works, and how it helps build visibility and understanding for the work youth organizations do, you can expand the range of information that is reviewed and shared based on the vision and strategy of your own organization. If you're doing this type of work, share your link in the comment section so others can be inspired by your own efforts.